When the targeted oral therapy, imatinib (Gleevec®) was approved by the U.S. Food & Drug Administration (FDA) in 2001, it revolutionized treatment for patients with chronic myeloid leukemia (CML), turning an almost certain death sentence into a chronic disease for most patients who receive the diagnosis. LLS played a significant role in the drug’s discovery and development, funding the preclinical and clinical research of Brian Druker, M.D., whose work led to its approval. The approval also ushered in a new era in how we approach treatment for many types of cancers. Rather than killing malignant cells with toxic chemotherapy, which also damages surrounding healthy cells and causes many harmful side effects, this approach to treatment involves targeting the genetic mutation driving the cancer. 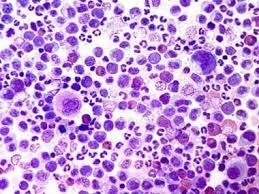 The approval of imatinib dramatically changed the standard of care for CML, and was quickly followed by other therapies for CML that work similarly by inhibiting the mutated BCR-ABL gene causing the cancer. Among these therapies was a drug called nilotinib (Tasigna®), first FDA approved in 2007 for patients who didn’t respond to imatinib. LLS also supported research leading to this approval. Late last month, the FDA issued another groundbreaking decision impacting CML patients. Studies have found that certain patients who take nilotinib daily have achieved such deep remissions that there are no traces of the cancer found in their blood cells. For those patients, the FDA has announced that they may be able to successfully discontinue their treatment with nilotinib. This is a dramatic development for patients with CML. Imatinib and similar drugs have saved hundreds of thousands of people, but patients need to take a pill daily for the rest of their lives. This new decision by the FDA means that certain patients may actually be cured of their disease – and may be able to stop treatment. The FDA says that these patients must continue to be monitored for any signs of relapse. Read more about the FDA’s decision here. We encourage you to speak with your medical providers on the best course of treatment for you. You can also contact our Information Resource Center at 1-800-955-4572, via Live Chat or email with any questions about treatment.